Not many Singaporeans are aware of how much the taxpayer-funded grassroots have been used by the PAP for political gain. Last week, Mr Eric Low and Mr Sitoh Yih Pin, the PAP MP-aspirants who lost to Workers’ Party’s Low Thia Khiang and SDA’s Chiam See Tong respectively in the last election, grabbed the limelight for themselves by announcing HDB’s decision to upgrade lifts in Potong Pasir and Hougang. I had written an article questioning why HDB had informed the losing candidates in opposition wards of the upgrading plans. They forgot to mention that these “advisers” are always PAP men, whether or not they won the election. The People’s Association (PA), a statutory board under the Ministry of Community Development, Youth and Sports, was set up in 1960 to counter the influence of Chinese clan associations and unions on working class Singaporeans. Like all other stat boards, it receives a yearly grant from the government to run its programmes and cover operational costs. In FY2008, PA received $280 million from taxpayers, and another $23 million in “operating income”. It spent a total of $320 million last year. However unlike most stat boards, whose chairmen are usually the permanent secretary of the parent ministry or some other senior civil servant, PA’s chairman is none other than the Prime Minister. The deputy chairman and two other board members are PAP ministers, together with a PAP minister of state, two other PAP office holders and a PAP backbencher. Eight out of the 14 board members are PAP MPs. No other public sector board in Singapore has so many “Men in White” on it. The PA oversees all the official “grassroots organisations”, namely the Citizens’ Consultative Committees (CCC), Community Club Management Committees (CCMC), Residents’ Committees (RC), Neighbourhood Committees (NC) and the Community Development Councils (CDC). PA also runs the National Youth Council (NYC) and the People’s Association Youth Movement (PAYM), which reach out to young people. The de facto leader of all the CCCs, CCMCs, RCs and NCs in each constituency is known as the “adviser to the grassroots organisations (GROs)”. This adviser is appointed by PA, presumably with the nod of its chairman, the Prime Minister. In PAP constituencies, PA always appoints the elected MP as the adviser. But in opposition wards, PA appoints the PAP candidate who lost in the last election, not the opposition MP. The same anomaly is repeated in the CDCs. CDCs have a whole panel of advisers, who are by default the GRO advisers. In South West CDC, where all the component constituencies are under the PAP, it is not surprising that all the advisers are PAP MPs. But in South East CDC, there is one grinning adviser who is not an MP — Sitoh Yih Pin, the man who lost to Mr Chiam See Tong (SDA) in Potong Pasir. North East CDC also has a non-MP — Eric Low — sitting as adviser. He lost to Mr Low Thia Khiang (WP) in the last two elections, garnering just 37% of the popular vote in 2006. Mr Low Thia Khiang and Mr Chiam See Tong are completely excluded from the CDCs. CDCs, Community Clubs and other GROs often organise events which involve a large number of residents. Most of the time, the guest-of-honour at such events is — you guessed it — the PAP grassroots adviser. All this effectively denies the opposition MPs access to the whole array of grassroots resources that PAP MPs have easy access to. The opposition MP has to build up his own grassroot network from scratch, while PAP MPs simply inherit the control of the RCs, CCCs and CCMCs. Most HDB dwellers will be familiar with the notice boards next to the lifts. These are managed by the RCs, which ensure that residents always aware of who their PAP MPs are by featuring their names and photos prominently on the notice boards. But in Hougang and Potong Pasir, instead of the elected MP, residents will see the losing PAP candidate’s face on the notice board every day when they go home. 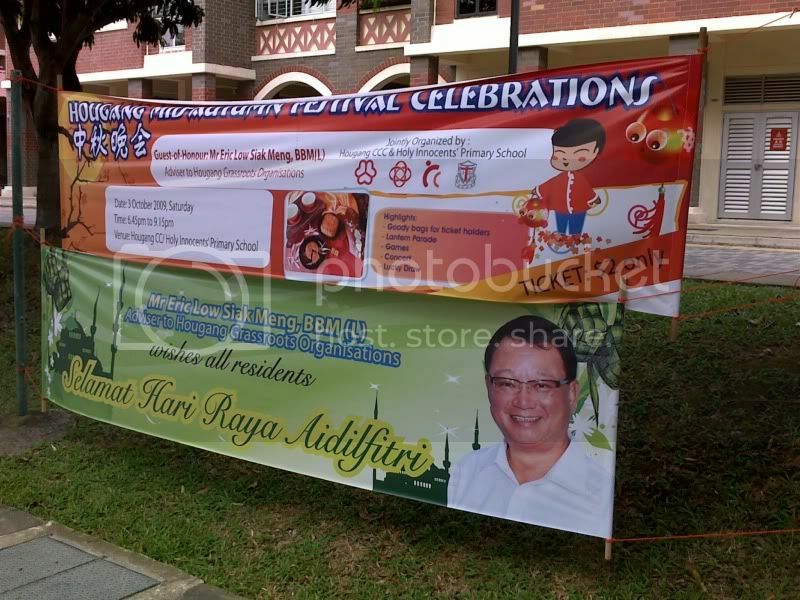 Around the neighbourhood, they will also see huge banners sponsored by PA or the CCC, featuring the losing PAP candidate wishing residents during festive occasions. The Opposition is given no such banner space in PAP wards. To round it off, the GROs are often the recruiting ground for the PAP during elections. Many grassroots volunteers are also loyal PAP men and women, who shed their supposed neutrality to don PAP all-whites during the election campaign, serving as supporters, election agents and counting agents for the PAP candidates. The best thing of all for the PAP is that all these grassroots resources come at zero cost to the party, since it is all paid for by taxpayers — yes including those who voted for the Opposition. Unlike in other countries where political parties — just like the Opposition here — have to fund their own grassroots activities, the PAP can save its funds to be used during the election campaign. With all these factors stacked against the Opposition, it is indeed commendable that Mr Chiam See Tong and Mr Low Thia Khiang have managed to hold on to their seats for the past 20 years. The residents of Potong Pasir and Hougang have proven that sincerity and pure hard work on the ground will be rewarded. I agree fully with your views. Thanks for providing the background and data to substantiate the case. Of all the things that makes the PAP a success, this is the one of the biggest stain on their white uniforms. Given that they already have the huge majority in government, why do they still have to monopolise the grassroots machinery totally to their own cause? So much for calling for an inclusive and gracious society, when it’s simply the pot calling the kettle black (or white, in this case). Mervyn – Thanks for sharing your thoughts. >Given that they already have the huge majority in government, why do they still have to monopolise the grassroots machinery totally to their own cause? 3. Because they know they have thoroughly depoliticized Singaporeans, so one way to get Singaporeans involved in grassroots work is to pitch it as being “non-partisan”. Whoever came up with the idea of letting Mr Eric Low and Mr Sitoh Yih Pin announce the lift upgrading program made a big mistake. It is doing them more harm than good. Now that explains why the PM complain that with many opp party members in parliament, he will have no time fixing opp party and buying supporter’s vote. He is busily fixing the opp party and supporter’s vote using grassroot org, and now doing whatever to gain support of foreigner citizens and PR . Thanks for the illuminating piece on the true nature of PA.
All I can say of the incestuous relationships between PA, grassroots and PAP is — DISGUSTING. You champion equal opportunity. You shout for fair treatment. Yet you are fully aware that you have taken your place in Parliament at the expense of your mentor. You are no different from the people you are criticising. Jerry: The party voted for Gerald to be NCMP because he is better able to speak and analyse issues. Eric, on the other hand, performed poorly even at the recent rallies. Will it be fair to Singaporeans if we pick someone less capable to speak for us? Gerald, you should spend your time on real and important issues, rather than nitpicking on these. Whoever voted for you guys want an alternative voice, not additional noise. Please put your time to better use, rather than playing politics. Hi Edwin, I do not think it is additional noise, nitpicking or playing politics. It is valid issue and statement. Hope you are not grassroots yourself. It is fair comment from Gerald Giam as Singaporeans want a government to set good precedents for future governments. This also impact the cost of government which impact the amount of taxes we pay. Too many grassroots organisations will increase cost of government as PA funds all these organisations. Many recent cases of grassroots corruption and bullying have been well documented. It is time this old issue take centre stage. How does get into one of these CCC or CCMC? many of those in the CCs do not support the PAP. So pls don’t “Saboh” the good things of the PA.
Look at the oppositions and their attitude to the PA, no wonder they are not allowed to be advisors. Tell me that Low Thia Kiang or the Hougang Town council in the past did not saboh the PA events, such as dinner for residents. The town council shut off the water and power in the middle of the events to saboh them. Also LTK and CST vehemently oppose the PA. Any sane PA chairman would not appoint them. With WP to openly say that they would attack the PA and disband it if they get into power, would they be put as advisors so that they can tear down the CC? The CC is essential to community work. Pls do not discredit it simply because u were not selected in. Not everyone don white during elections. There are open opposition supporters in the various committees. So what can you say? Bobo is a bobo Shooter, shooting blanks. Bobo only reads ST, CNA, Wanbao, Shin Min, InSing , STOMP etc that why spew so much rubbish. Those examples Bobo gave Hougang Town Council already gave reasons and explain the Grassroots abuse their allocated time and refuse to finish on time and thus automatically,the utilities are cut off and it only happen once. The first shots are fired by PA Grassroots and their PAP folks. 46 years of PA Grassroots track record do not lie. The CCCs, RCs, CDACs, CDCs, SINDA, Mendaki are only lead by PAP MPs for a reason and it is political and abuse of taxpayers money. After JBJ because first non-PAP MP at Anson, the PA Grassroots gave JBJ and WP a hard time like refusing to cooperate with JBJ, disallow WP to build kindergartens, fabricating lies of WP to residents, sowing discord at Opposition areas, bullying residents, conducting sabotage, creating trouble and threathening residents and so on. PAP regularly refuse to develop Hougang and Potong Pasir for 20 odd years while Chiam and Low were MPs there and this makes Bobo’s ‘complaints’ look like nothing.Denying residents there shopping centres, cinemas, hawker centres etc which was divisive, partisan and evil. During elections, when Parliament disband and there is no more government, why PA Grassroots volunteers and facilities only help out PAP candidates and not other party candidates. Why CC toilets cannot be use for opposition rally attendees but can use to for PAP rendevous point to fetch PAP supporters to rallies.? PM Lee still dare say PA is non-partisan. Who believe ?? LTK wants to shut down PA is because it is a waste of taxpayers money as it poor track record of 46 years shows PA only benefits PAP and not Singaporeans and Singapore. PA divides Singaporeans and Singapore. PA Grassroots started all the nonsense ever since the first Opposition MP was elected. Look at your own PA Grassroots conduct first before accusing WP. Hypocrite.